Divide a complex component into 2 separate but related inheritance hierarchies. Both the abstractions and their implementations should be extensible using subclasses. Changes in the implementation of an abstraction should have no impact on clients; that is, you should not have to recompile their code. b) abstraction can vary independently. The bridge uses encapsulation, aggregation, and can use inheritance to separate responsibilities into different classes. When a class varies often, the features of object-oriented programming become very useful because changes to a program's code can be made easily with minimal prior knowledge about the program. The bridge pattern is useful when both the class as well as what it does vary often. The 1) class itself can be thought of as the implementation and 2) what the class can do as the abstraction. 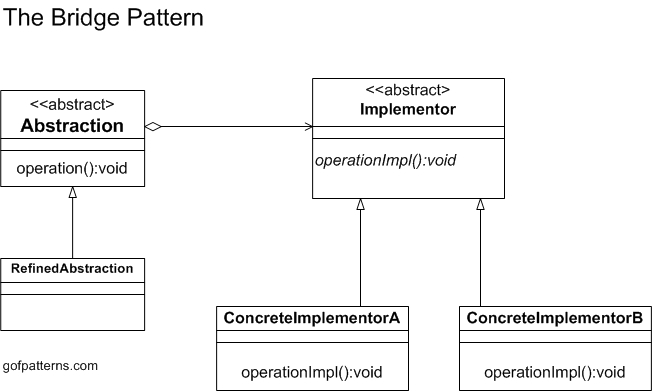 The bridge pattern can also be thought of as two layers of abstraction.